The Oceanis Beach and Spa Resort is an adults only, 4-star plus hotel with 398 guestrooms and suites located right on the beach in Psalidi, about 4 km from the center of Kos town. Situated 35 km from the airport, the hotel is especially designed for couples, offering beautiful and romantic sceneries suitable for weddings or renewal of vows at the picturesque church on the grounds. The main pool, right in front of the sea, offers a pool bar with exotic and refreshing drinks and cocktails. Tranquil, enchanting, romantic, simply stunning! Our chapel is the perfect area for your wedding ceremony. The Chapel is part of our standard wedding packages. 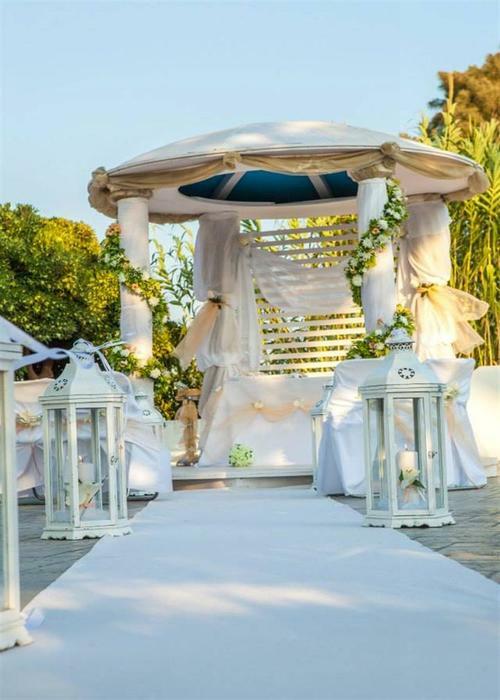 Our expertise together with the amazing landscape of our gardens will certainly make your Big Day and unforgettable experience. The gardens are part of our upgraded wedding packages. The reception venue will be selected based on the total number of guests attending the wedding.